Shelley Spector, Frances Loves Katherine, 2014, wood and paint, 17 x 9 x 17". Shelley Spector’s exhibition “Keep the Home Fires Burning” exists in an archival mode—as seen in other recent shows by Krüger & Pardeller and Willem de Rooij—in which the artist turns toward a museum collection as the basis for her practice, incorporating historical works in her exhibition to tease out their relevance in the present moment. Drawing from this museum’s textile collection, Spector juxtaposes her new works with a large embroidery of Pennsylvania German motifs that was designed by folk-art historian Frances Lichten in 1943 and donated to the museum by Lichten’s partner, artist Katherine Milhous. The tapestry hangs front and center in the gallery between two entranceways, giving the impression that Spector’s many sculptures emanate from it spatially, aesthetically, and conceptually. 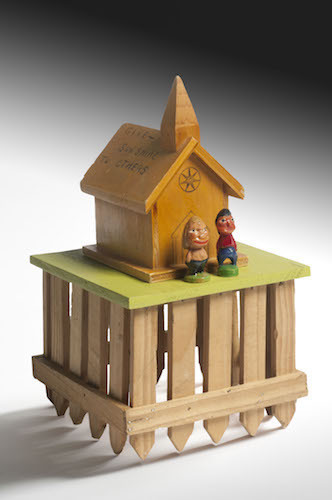 Among the sculptures are a carved mustard-colored bird; a tiny wooden church on a green with two modeled women at its door, Frances Loves Katherine, 2014; and a plush round maroon rug on which visitors can lie and look up at the huge hand-knotted lamp shade–like flowers of From Seeds to Seeds, 2014–15, that echo the embroidery’s village scenes, curvilinear design, and colors. Each work is a microcosm of the exhibition’s push and pull between past and present that calls up the previous lives of Spector’s secondhand domestic materials, such as cane chairs, thrifted T-shirts, and sewing tins. Together with a looping sound track of love songs, the whole installation evokes the ideal comfort and safety of home. The exhibition’s title, however, invokes Ivor Novello’s 1914 wartime anthem of the same name—a reminder that we crave domestic warmth in fearful times. Kindling our own desires, Spector creates empathy.